Christian Jane Austen Variations 3: Pamela Aidan – Faith, Science, Joy, … and Jane Austen! “I cannot deny that duty has been more often my motivation than anything approaching real devotion. . . . At least, that would be Reverend Whitefield’s assessment.” –Darcy, An Assembly Such as This, p. 24. This compelling series was hard to put down. At first I thought it would just be a retelling of Pride and Prejudice from Darcy’s point of view—which it is—but it is much more. We see Darcy’s adventures during the long periods when he disappears from view in the original novel. How did he try to overcome his initial attraction to Elizabeth? No doubt he would have searched for an appropriate woman from his own social class. In these books, he goes through exciting adventures in looking, including standing stones (like Stonehenge), ritual sacrifice, and Irish plots! And how did he change after his first failed proposal? And how could he bring himself to search for and pay off Wickham? Christian themes are subtle in these novels. Darcy and Elizabeth are both serious about their faith and worship appropriately in Anglican churches, as Austen herself did. (In the first book Aidan mentions their singing hymns, but in the later books corrects that to singing Psalms, which was far more likely at that time.) Darcy clearly lives a more godly life than most of his class, as the original novel implies. He also reads sermons by the famous evangelist George Whitefield. Caroline Bingley and other less-serious characters only put on a show of going to church. The second book, Duty and Desire, has the most openly religious references. It begins with a church service which includes a powerful Scripture passage confronting many of the sins prevalent in Austen’s world. However, the passage is counteracted by a sermon that waters down man’s sinfulness–typical of sermons of that time. Later in the book, Georgiana finds healing and forgiveness in a more Evangelical faith. She reads William Wilberforce’s book which confronted society’s lack of faith. Georgiana’s new companion, Mrs. Annesley, is the widow of a clergyman very involved in helping the poor. 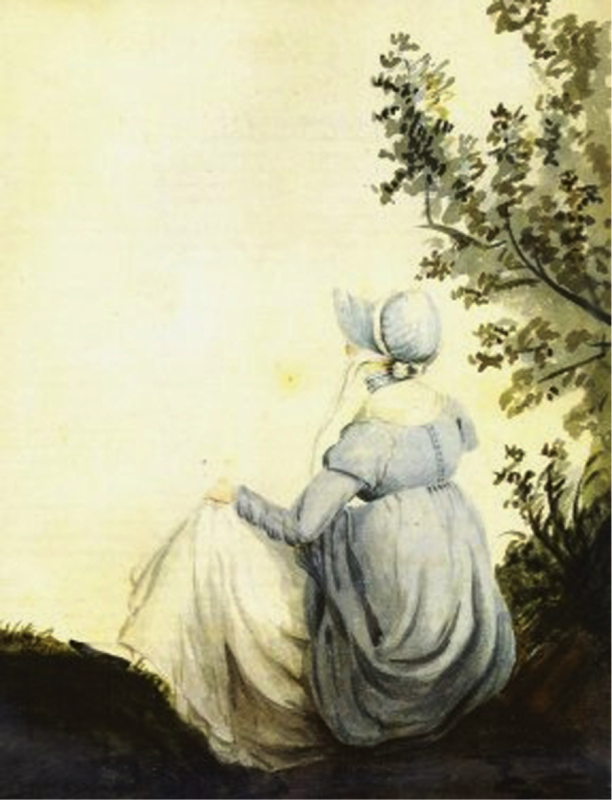 She reminds Darcy of God’s providence and work, which has changed Georgiana’s life. Georgiana even gets Darcy out to visit the poor of the parish, and supports a charity for “Returning Young Women to Their Friends in the Country”—young women seduced by a man’s promises, as Wickham seduced Lydia. Georgiana’s Evangelical faith is not elaborated as much as I would have liked, but it’s there. Later Darcy struggles to forgive Wickham, rather than seeking vengeance. Darcy, as we all know, is humbled by Elizabeth’s refusal and learns to truly love, as well as to hope. Early in this third novel, Mr. Collins preaches a sermon on “religious affection,” inspired by Lady Catherine de Bourgh. He preaches strongly against “enthusiasm.” The word “enthusiasm” described any who believed religion was a matter of the heart as well as the head, including Methodists and Evangelicals. Collins, like most non-Evangelical clergy of the time, encourages trust in “Reason, the Divine’s handmaiden,” and “self-reformation,” which Darcy realizes that he needs. The novels also refer to political and social issues, including the Luddite rebellions against industrialization, Lord Byron’s scandals, war with France, and Irish plots for independence. Quotations from Shakespeare and from Milton’s Paradise Lost are interwoven through the story. However the main emphasis is on Darcy’s internal struggles and growth. He learns to recognize the evils in his own heart, and moves toward gratitude and humility. This series is beautifully written, with fun subplots and deep insights into Darcy and Georgiana’s characters, as well as several other well-developed original characters. A worthwhile and entertaining read. Mrs. Annesley comforts Georgiana with the truths that all things work together for good for those who love God, and that adversity brings good results in our lives in the long run (Duty and Desire, p. 45). Do these truths comfort you in your struggles today? These are such wonderful books! Thanks for helping to spread the word with this review. Yes, I agree, Laura! And I’ll be reviewing a couple of your wonderful books in the next few months, Lord willing! My two favorite Christian JAFF books/series you have already reviewed in this series: Maria Grace’s Given Good Principles series (which I read as one book minus Twelfth Night at Longbourn on fanfiction.net long ago), and Jenna Elsworth’s To Refine like Silver, my favorite Christian JAFF. Thank you for recommending other Christian JAFF–I can’t wait to read them all!!! Thanks, Susanne! I trust you’ll enjoy them all! Thank you for including me in your reviews of JFF with Christian influences. Although my aim was to be subtle, I typically got more criticism than kudos for doing so from the general public. Either critics were incensed that they had to read something “religious” in a book they otherwise admired, or they lacked an accurate historical knowledge of the time and accused me of importing current day American evangelicalism into the British Recency era for my own nefarious reasons. Little did they know that all of my least “subtle” sermonizing came almost word for word from William Wiberforce’s fabulously popular book “A Practical View of the Prevailing Religious System of Professed Christians, in the Middle and Higher Classes in this Country, Contrasted with Real Christianity” published in 1797. I can not believe that Austen’s family did not own a copy. Thanks again for your gracious review. My pleasure, Pamela. One reason I started researching the church in Austen’s England is that I did NOT want to import modern evangelical terminology and assumptions into a novel on the time period. But I discovered that so many evangelical ideas came straight out of this time period! And I did catch you quoting Wilberforce’s wonderful book; that was a delight! The Knight family doesn’t list a copy of the book. But it was extremely widely read, and it seems very likely to me that Austen, who certainly was familiar with Hannah More, would not have read Wilberforce also; perhaps from her lending library, if her father didn’t own it. So your use of the book is very appropriate, I agree!